Born and raised in Singapore, Claire started out playing the piano and violin at a young age, studying classical music. She taught her first violin lesson at 16. Soon after, Claire decided to pursue music full-time after finishing Secondary School. 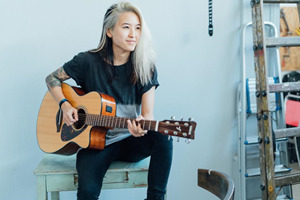 That was when she began performing gigs all around Singapore since 2004, playing folk/acoustic/rock originals and covers with her first local band, Zsa+Claire. She made the move to Boston in 2013 to pursue training in the recording arts and to immerse herself in the rich history of American music. The melding of her artistic message honed with these musical influences and technological skills gathered over the next few years resulted in the indie-rock project, Paper Citizen. Paper Citizen is now in the middle of recording their 2nd EP, titled Distraction. This album is inspired by very personal experiences had in the last 5 years, such as learning the difference from eastern to western cultures, discovering new music, falling in love, heartbreak, the feeling of loneliness, and making steps to adopt Boston as her new home away from home. While being very personal, thematically Paper Citizen also draws from trends observed in present society, such as the dynamic between the constant interconnectedness that modern technology provides, and on the other hand, the deep sense of isolation and increasing difficulty to connect with others. Paper Citizen was voted Deli Magazine’s “New England Emerging Artist of the Month” for October 2016, and was nominated in the 2017 New England Music Awards for the category New Act of the Year.